A horse has been caught by a speed camera in Germany. The runaway nag had escaped from a paddock and dashed off down a busy main road and into the town of Meppen in Emsland in the province of Lower Saxony. 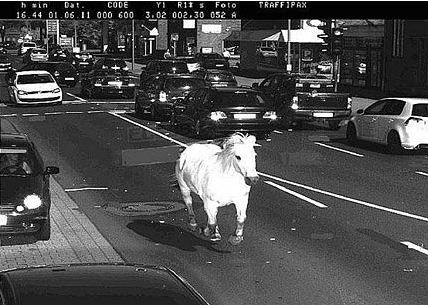 A police spokesman said: “The horse was galloping at full speed for several kilometers before it could be stopped and caught – and led back home.”The picture was taken by a camera set to take pictures of speeding motorists and people going over the red light – and it was actually a car driver that triggered the picture and the horse ended up being snapped in the same picture.